Matanuska Lake is located about 35 miles northeast of Anchorage, where Koenig was last seen on video surveillance being abducted by an armed and masked man on February 1, 2012. Law enforcement officials, including a FBI search team, used snowmobiles and ATVs to navigate across the frozen lake. They used chainsaws to cut a four-foot hole in the ice to allow divers access to the lake’s water. Diver’s then began their search of Matanuska Lake, where Samantha’s remains were eventually recovered. The recovery of Samantha Koenig’s body came just a couple of weeks after the Federal Bureau of Investigation arrested their “one and only person of interest” in the Koenig disappearance, Israel Keyes. Keyes had fled Alaska shortly after Samantha Koenig was abducted. At the time of this publishing, Israel Keyes has only been charged with one federal count of access device fraud. However, the FBI has ensured the public that authorities are preparing criminal charges against Israel Keyes for the abduction and murder of Samantha Koenig. The access device fraud charge that Keyes has been charged with is because the FBI alleges that just hours after Koenig’s disappearance, Keyes burglarized a vehicle and stole someone’s debit card and used it to make several unauthorized withdraws. Keyes used the stolen money to fund his escape from Alaska, which led him through California, Arizona, New Mexico, and finally ended with his arrest in Texas. Keyes has since been extradited back to Alaska to face the access device fraud in federal court. It is also expected that he will face a list of charges regarding the abduction and subsequent murder of Samantha Koenig. The exact charges that Keyes is going to be charged with regarding Samantha’s disappearance and murder have not yet been released by authorities. Mary Rook, the special agent in charge of the FBI’s Anchorage Division, is asking for any additional information about Israel Keyes to please be reported to the FBI’s Anchorage Division. They are specifically looking for any information regarding a white Chevrolet pickup truck that Keyes used for his company, Keyes Construction. They are also seeking tips from anyone who helped Keyes remove a large utility rack from the aforementioned truck. Authorities are especially interested in speaking with anyone who seen Keyes driving his white work truck in the vicinity of Matanuska Lake and/or anyone who seen him driving the same truck on February 1, 2012 around 8:00 p.m. in the area of the Common Grounds Espresso stand on Tudor Rd., near Gambell St., in Anchorage, AK. Anyone with any of the information mentioned above, any other information regarding Samantha Koenig’s abduction and subsequent murder, and/or any additional information about Israel Keyes is strongly urged to contact the FBI’s Anchorage, Alaska Division at (907) 276-4441 or the Anchorage Police Department at (907) 786-8900. Police say Samantha Koenig, 18 year old from Anchorage, AK disappeared from her place of business around 8pm Wednesday, February 1, 2012. Samantha worked as a barista at a popular coffee shop at a busy intersection. Police say Samantha was on camera being forced to leave the coffee shop by a man dressed in all black, but are unsure if this was the same man Samantha had filed for a restraining order against earlier this year. It is believed that the man was armed, and headed toward the Old Seward Highway. Samantha’s boyfriend, Dwayne, had planned on picking her up that night when she got off work at 8pm, but was held up by his own job, states her father. Along with Samantha missing, so was the money that had been in the cash drawers that evening. Melanie Ornelas, Common Grounds barista, said that when she arrived in the morning, it was apparent that no one had cleaned, but it did not immediately raise any concerns. She noticed that Samantha’s things were still in her cubby in the back and she had left a note asking if she was scheduled to work that Saturday. Determined to get a job, James Koenig Jr, Samanatha’s father, stated that he did not want her to work there in the first place. He wanted her to explore other options such as nursing or veterinary school, as they had previously talked about. Keonig also says that Samantha had filed for a restraining order against a man that she did not know for very long, but then was scared to show up to the court date for fear of he might do something. 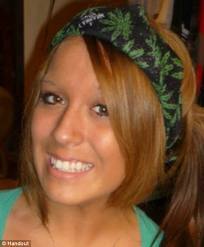 Samantha had only worked at the coffee shops for a few months before she went missing. Co-workers describe her personality as bubbly and energetic.